The latest edition of 20 Questions is a dream come true… Meet the team of real estate marketing Ninjas behind The Sea to Sky Dream Team. 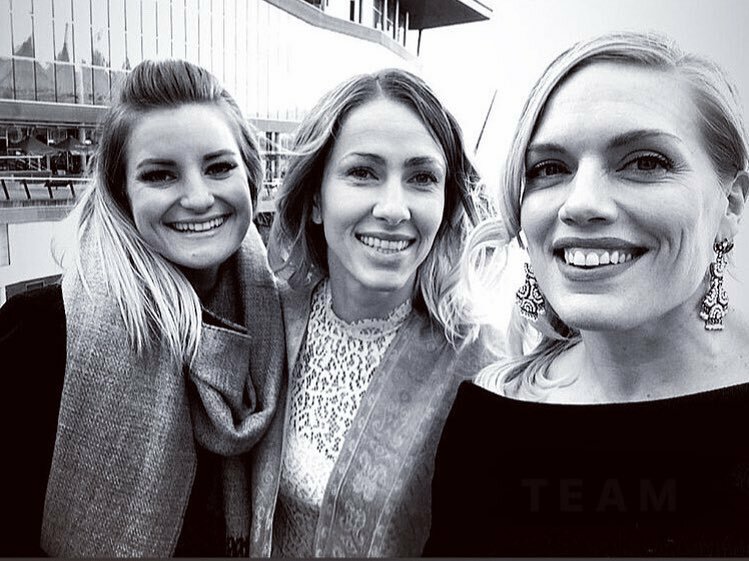 Recognizing each others’ individual strengths in the real estate business, Dana, Madison, Kristen & their marketing Coordinator, Robin decided to join forces this year to create a powerhouse team of agents serving the Sea to Sky corridor. Introducing the Sea to Sky Dream Team. 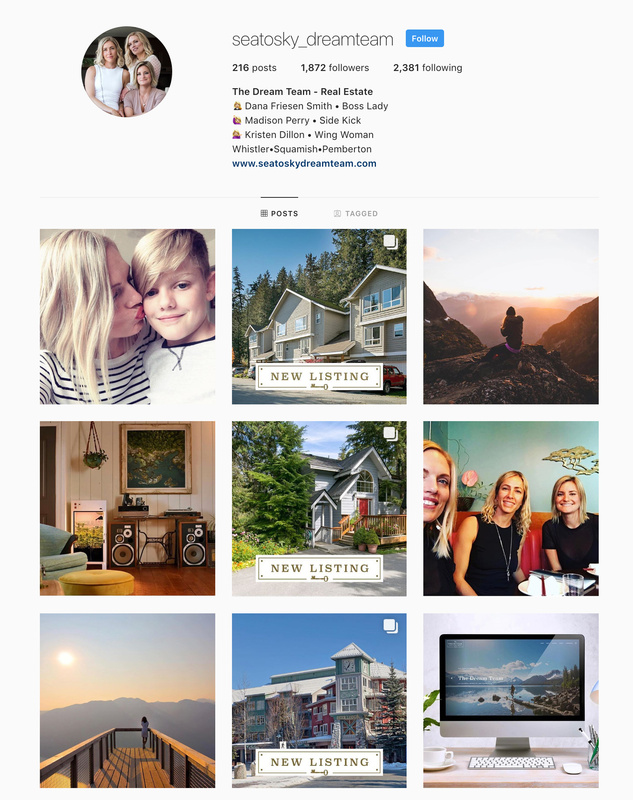 Dana Friesen Smith – the boss lady at The Sea to Sky Dream Team – has been a RealtyNinja customer for years, which is why we were so excited to help with the evolution of her brand and their new team website in 2018. Check out the Sea to Sky Dream Team website, built with Katana. Dana, Madison, Kristen & Robin each have their own unique strengths & personalities which help them excel in their roles within the team. Their tenacious dedication to this business is second to none in the Sea to Sky real estate game, and it shows with their awards and accolades. Having all grown up in BC, and now all residing in the Sea to Sky corridor, they have a keen understanding of the landscape and it’s residents. This affinity for and understanding of their town helps them provide tremendous value to their clients every day. Before diving into our 20 questions with these Ninjas, let’s take a closer look at some successful Sea to Sky Dream Team modern marketing strategies. Understanding the importance of a strong web presence is essential to standing out in any Canadian real estate market. Squamish, Pemberton & Whistler are no exceptions to this rule. 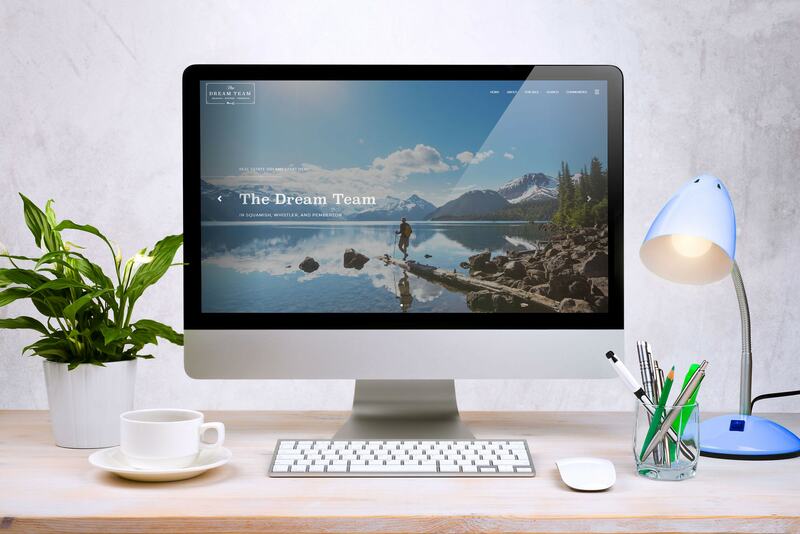 That’s why The Sea to Sky Dream Team had no hesitations about carefully planning out their website strategy, and then employing the Design Ninjas at RealtyNinja to help make their vision a reality online by ordering a fully customized website design. Every week I host a “Demo Webinar“ where I show people how to sign up for and use a RealtyNinja website. Before I dive into the meat of the webinar, I like to show off some of our best websites. The Sea to Sky Dream Team website is ALWAYS the first one I showcase during this webinar, since it’s probably one of the nicest websites we’ve created to date. Simply put, don’t skimp out on your real estate website design. With a RealtyNinja customization, you don’t have to spend $10,000 to get an incredible website that matches your brand. You do, however, own your website domain. You have the opportunity to fully customize your website in such a way that it “WOWS” your visitors. If the answer is anything besides “Absolutely,” then you probably have some work to do. Let the Ninjas know if we can help. When I visited The Sea to Sky Dream Team’s blog, it occurred to me that these Ninjas are employing video marketing! WIN! Not only are Dana, Madison & Kristen creating value for the online community with informative videos for potential clients, they are also creating beautiful property videos to promote their listings. These videos feature the whole team, while also highlighting the property in a stunning way. In the video above, you get to meet each member of the team and see their unique personalities, you get to learn about the property, view walkthrough clips of the interior, the amenities, and even beautiful drone video showing the whole lot from high above. All of that in under 3 minutes…. Well done, Ninjas! If you’re able to, create well planned out, high quality videos like The Sea to Sky Dream Team. But if you’re not, just film videos on your iPhone for your audience. Video > Text & Images any day! We live in an attention economy – everyone online is trying to steal our attention away to look at their content. Literally everyone from Netflix to your neighbour’s dog on Instagram. How are you going to stand out amongst all the noise out there? One really helpful strategy to adopt and excel in is video marketing. One of the features built into The Sea to Sky Dream Team’s Katana website is their Instagram feed at the foot of their homepage. It was one of the first things I noticed about them when visiting their website – they were prominently highlighting their primary social media channel. While they are present on Facebook, Twitter, YouTube, LinkedIn and more, The Sea to Sky Dream Team is clearly focusing their efforts on one social media channel above others. This strategy was no accident. As you scan through their Instagram posts and profile, you see their dedication to this social network. Lots of beautiful photos, tons of followers, so many likes, and consistent branding throughout the account. Love it! And they also do something else very important on their Instagram Account (@seatosky_dreamteam) – they link back to their Katana website – AKA the online-hub for their brand. It’s always good to claim the username on various social networks so that you are present all over the web – wherever your ideal clients are present! That being said, you don’t need to dedicate all of your time to keeping every social network hyper-active. This can be an exhausting process, and without a dedicated social media marketer, it can eat up practically all of your time. Instead of trying to be the social media rockstar on every platform, pick one (or two,) and be really awesome and consistent there! Identify your social media strategy, stick to it, and you will see returns. As you can see from the screenshot above, The Sea to Sky Dream Team has a consistent style and treatment to their Instagram posts, and it’s paying dividends. 1,800+ followers is not a joke! Imagine 1,800 people in a room, that’s one heck of a party! Take a page out of the Sea to Sky Dream Team’s book and focus your social media marketing efforts to see maximum return on your online efforts. We couldn’t be more proud to have awesome REALTORS® like Dana, Kristen & Madison as part of our Ninja family. These ladies have a keen understanding of what it takes to be modern real estate marketers. Their online brand connects to who they are as agents in real life. We can all stand to learn a thing or two from this powerhouse team. It’s time for me to stop talking, so I can let Dana, Kristen, Madison & Robin take the floor and answer our 20 Questions! 1. What are you most excited about for the Winter? Dana: Back Country Skiing. I really want to make this a priority this year and get into the nature we are so lucky to be surrounded by all the time in the Sea to Sky! Kristen: Candy canes. Like a never-ending supply of delicious mints (I love mints!). Also I like January when the busyness of Christmas is over, the year resets and I batten down the hatches on nutrition. see ya month-long candy cane binge..
Madison: 30+ CM Powder Days – Early morning runs before jumping into a full day in the office or out with touring with clients. Good for the soul. 2. What’s the last photo taken on your phone? Kristen: A series of funny misspelled tattoo memes…. one that was meant to say Baby Girl and instead says, “Babby Girl” haha. Another one on the back of someone’s neck that says “real eyes, real lies, realize” haha. I have a jillion screen grabs on my phone of amusing quotes, or things that make me laugh…. you know? So you can drop that on your friends when sh*t goes down. Madison: Hand written images of ideas for new marketing on instagram. Robin: A photo of an instagram layout that I really like. We are redesigning our @Seatosky_dreamteam instagram. 3. If you were an animal, which animal would you be and why? Dana: I think I would be a Dog. They lead a simple life of unconditional love and living in the moment. I think I could enjoy living with those two principals as my only way of understanding. Kristen: Some kind of large cat cuz I eat meat! Madison: Classic – some sort of bird so I could fly. Robin: A Dolphin….. They are so social and they’re always having such a good time. 4. What’s your favourite neighbourhood and why? Dana: I’m a White Gold kind of girl. Some lots have the most epic views of Whistler/Blackcomb, it is Sunny, and it is walkable to Whistler Village. Kristen: Exactly where I am. Garibaldi Estates. walking distance to everything. A well-worn path to Sushi Sen.
Madison: White Gold in Whistler- Close to everything, walkable, amenities close by, family orientated. 5. If you could start learning a new skill or take up a new hobby today, what would it be? Dana: I have always wanted to be a musician so I would take up the guitar. 6. If someone was making a film about your life, which famous actor would play you? Madison: Good lord, I have no clue. A female actor that gets S*$& done. Maybe Julia Roberts in Erin Brockovich????? no clue. 7. What might that movie be called? Robin: Memoirs of a hobby hoarder or Eat your cake first or Adventures of the pleasant dictator…..
8. What are three items you want with you if you were stranded on a deserted island? 9. When you think of the word successful, who is the first person that comes to mind? Kristen: Oprah. I know it’s cliche but she’s really shaped a generation. 10. If you could erect a giant billboard in the middle of your town with anything on it, what would it display? 11. What is one unique ritual you have in the morning? Kristen: Coffee and shouting at Henry to get his shoes on as quickly as possible. Madison: Walking my dog. It’s not unique but its the only thing I consistently do every morning. 12. Who is one person you wouldn’t mind ninja-kicking? Kristen: Mr.Bean (the worst), Stephen Harper (still mad at him), whoever shot Tupac (so rude) and all the people who can’t figure out they’re, their and there. Madison: A Realtor® that I dealt with last week in Lions Bay. Keeping their name to myself. Robin: Usually no one…. but at the moment if I had to choose…..obviously Donald Trump…..
13. Name three people (alive or dead) that you’d like to invite to dinner. Kristen: Chili Thom, Rum Tum Tugger from CATS and the whole TEAM YES crew. Madison: Dana Friesen Smith, Robin Jang & Kristen Dillon – So the Dream Team can have a night out together. That never happens LOL. 14. It’s Saturday at 9:00 pm: What are you most likely doing and where? Kristen: Haha lounging around at home thinking about how happy I am to be staying in, lounging around at home. Madison: Out for a late dinner in Whistler Village after a big day of work. 15. If you were not in Real Estate, what would you likely be doing today? Kristen: Graphic Design (that’s my skillset) and making fun of someone’s crappy fonts, in between training all day at the gym. 16. If you could time travel and witness any moment in the history of the world, what would it be? Kristen: Easy. The creation of earth so we could end the debate. 17. What’s one question you enjoy being asked? Dana: Is your dog a Ridgeback? Kristen: Can we write a subject-free offer today? Madison: I want to buy this home, can we write an offer on it? Robin: Do you want some cake? 18. What movie have you watched more than once? 19. If you could teleport back-and-forth between Vancouver and one other place in the world, where would that be? Kristen: Bora Bora. Never been, but pretty sure I’m meant to live there with Led Zeppelin, Netflix and a multitool. 20. Would you mind telling us something cool about one of your active listings? Dana: 5134 Alta Lake Road is an original cabin of Whistler on West Side Road that was so loved that the owners built 2500 square feet around it to maintain its authenticity and uniqueness while acquiring a updated modern home. Kristen: Our clients Kelly & Chad have the most fantastic collection of local art in their tantalus townhome. Madison: We have lots of cool listings. #2 – 1445 Vine Rd – Right in the middle of Pemberton – Great location & updated! Robin: We just dropped the price on our 5134 Alta Lake property ….. It has an amazing view and is steps away from the bike trail. It’s super cozy plus a separate Suite. It’s my dream home!